The Perseids Meteor Shower can be seen each year when up to 60 firework like streaks are seen per hour in the Northern Hemisphere. The event occurs mid July to Mid August with the most activity around the 13th of August. 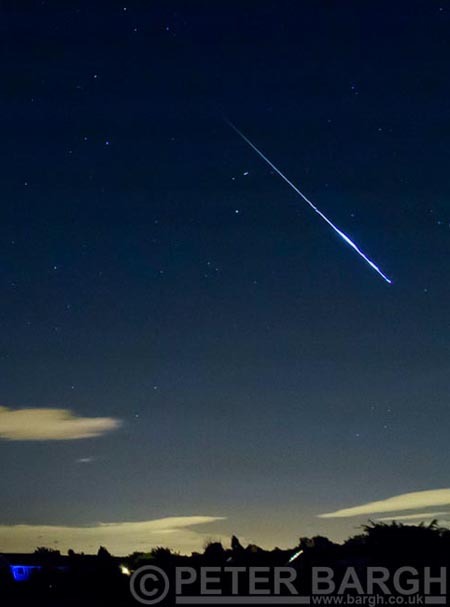 I went out last night from Midnight until 1:30am and saw around15 meteors. I sat in a field with my Olympus OM-D camera mounted on a tripod pointing up at the sky in a south facing direction with a 9mm wide angle lens so it would capture a wide zone of sky. I set the ISO to 800 and exposure to manual with a duration of 8seconds. I then took photos hoping that a meteor would appear during the exposure. The camera needed to process each frame to reduce noise between shots and that was also about 8 seconds. I took around 300 photos and managed to capture two trails.